The 6 Foot Connecting Board weighs only 10 lbs and is certified to hold 500 lbs. 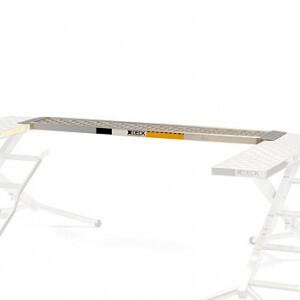 This Connecting Board comes standard without a handrail, but one can be purchased for it. The Connecting Boards sit virtually flush on the plank – preventing accidental tripping. One can connect the boards together to fit any need – be it a straight line, a “U” Shape, a “L” Shape, a “C” Shape, or even a “T” configuration.